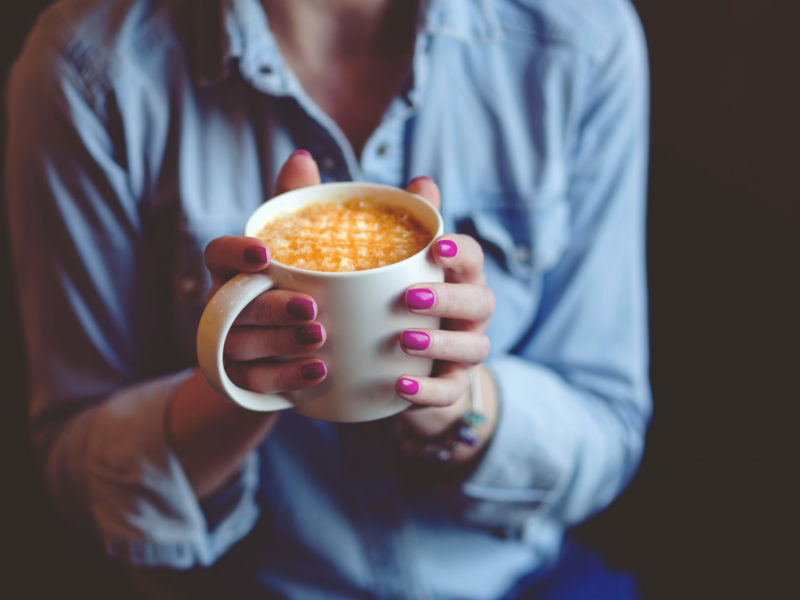 Home » Blog » The Reintroduction Quick-Start Guide: A New FREE download! The Reintroduction Quick-Start Guide: A New FREE download! There have been a couple of articles posted on other blogs lately criticizing the autoimmune protocol (AIP) for being unnecessarily restrictive for lifelong maintenance. Similar to a news article criticizing the Paleo diet for being an all-meat diet, these criticisms themselves grossly misrepresent the AIP. The autoimmune protocol is a powerful therapeutic diet, based on Paleo principles, designed to regulate the immune system and provide the body with the opportunity to heal. Tens of thousands of people have used the autoimmune protocol to manage and even reverse their chronic health conditions. But, it’s not a life sentence. The autoimmune protocol involves additional eliminations compared to the standard Paleo diet as well as a focus on increasing intake of the most nutrient-dense foods (seafood, organ meat, and tons of vegetables.). It’s also not just about food. Prioritizing sleep, managing stress, protecting circadian rhythms and getting appropriate levels of activity are all key features of this strategy to mitigate chronic disease. Even more importantly, the diet aspect of the autoimmune protocol is an elimination diet. It’s designed both to kickstart healing, but also to allow the individual to isolate trigger foods. Even those with severe life-threatening autoimmune diseases can typically successfully reintroduce some foods once they start to see substantial healing. And while it’s impossible to tell any individual how long they will need to follow the elimination phase of the AIP for before being able to successfully reintroduce foods (see this post), reintroductions are still generally encouraged. 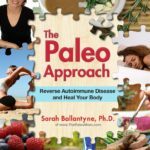 In fact, the entirety of Chapter 9 in The Paleo Approach is dedicated to when and how to tackle food reintroductions after a strict period of time following the autoimmune protocol. The best methodology for food reintroductions following an elimination diet is actually a field of intense research. I formulated the reintroduction protocols in The Paleo Approach based on the most current guidelines from several of the leading scientific researchers in the field (you can find the scientific citations in the appendix of The Paleo Approach). Today, I’m sharing the reintroduction protocol from The Paleo Approach for FREE with you! 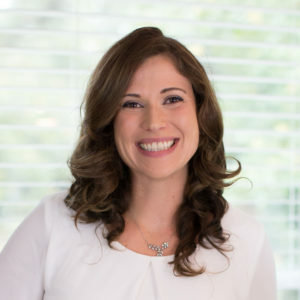 I’m doing this because there’s some very bad recommendations out there (perhaps appropriate for healthy people tackling a standard Paleo diet, but not for those of us with serious health conditions like autoimmune disease), and I feel that it’s my responsibility as the leading AIP blogger and author to provide you with the resources you need to be successful in your reintroduction process. So, here it is: The Paleo Approach Quick-Start Guide to Reintroducing Foods. It’s a completely free download (and no membership wall to boot!). Download my FREE Quick-Start Guide to Reintroducing Foods here. Note that this protocol for food reintroductions isn’t just for those following the autoimmune protocol. If you’ve been following a standard Paleo diet and want to see how you react to dairy or rice or lentils, for example, this science-based protocol is the best method for evaluating how you respond to a particular food. Are You Ready for Reintroductions? 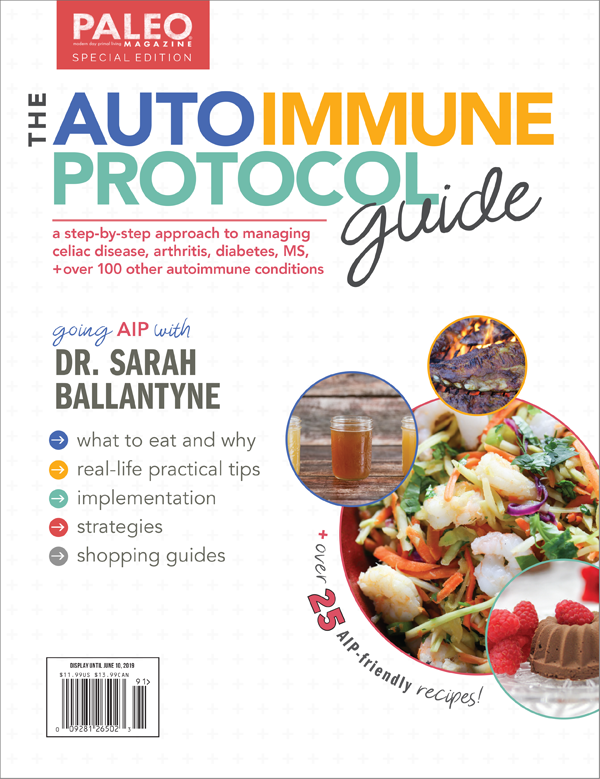 If you are using this protocol after following the AIP in order to manage an immune or autoimmune disease, then at a bare minimum, you should be strictly compliant with the Paleo Approach for at least one month (three to four months would be better) before reintroducing foods. And you should definitely see significant improvements in your symptoms first, with evidence that your gut has healed substantially and that your immune system is no longer attacking your body (which will be apparent by how you feel). 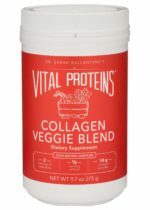 If you are using this protocol to reintroduce gray-area foods or traditional foods not normally part of the Paleo template, then 3 to 4 weeks of a strict Paleo diet is typically sufficient before doing reintroductions. It is very important to make sure that your stress is well managed, that your activity level is appropriate, that you are getting plenty of sleep every night, and that you are spending time outside every day before starting food reintroductions, because these all affect your body’s ability to tolerate foods as you reintroduce them. Reintroducing a food after eliminating it from your diet for a while is called an “oral food challenge test,” an “oral challenge,” or simply a “food challenge.” The suggested procedure for a food challenge detailed here assumes that you are not allergic to these foods—that is, you do not have an IgE-mediated reaction to them. If you have a diagnosed allergy to a food and want to perform a food challenge to see if your allergy persists, consult with your doctor. Food challenges are done one food at a time, once every three to seven days. If you generally tolerate new foods well as you challenge them, you can reintroduce them faster (every three to four days). If you are sensitive to many foods, you should reintroduce them more slowly (every six to seven days, or even longer). Reintroducing foods can be tricky because non-IgE reactions can take anywhere from an hour to a few days to manifest (although symptoms generally appear one to four hours after consuming the food and peak within four to twenty-four hours). Don’t reintroduce a new food if you have an infection, had an unusually strenuous workout, got less sleep than normal, are feeling unusually stressed, or are under any other circumstances that may make interpreting a reaction difficult. Want to print this infographic? It’s included in the FREE download! First, select a food to challenge. Be prepared to eat it two or three times in one day (but not again for a few days). If you have any symptoms, don’t eat any more. Next, eat one teaspoon of the food (a tiny bite). Wait fifteen minutes. If you have any symptoms, don’t eat any more. Next, eat one-and-a-half teaspoons of the food (a slightly bigger bite). That’s it for now. Wait two to three hours and monitor yourself for symptoms. Now eat a normal-size portion of the food—either by itself or as part of a meal. Do not eat that food again for three to seven days (and don’t reintroduce any other foods in that time, either). Monitor yourself for symptoms. If you have no symptoms in the next three to seven days, you may reincorporate this food into your diet. Maintain a food journal as you reintroduce foods. 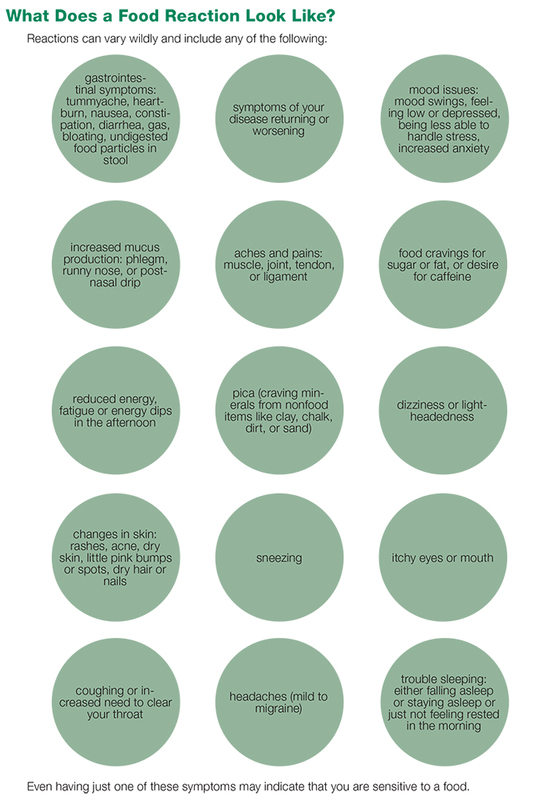 It can be a very simple list of what new food you ate on a particular day as well as any symptoms that might be attributed to that food (make note even if you don’t think it’s related). The reason this is so important is because sometimes symptoms can creep up on you. It is easy to want a food to be tolerated so badly that you ignore your body’s reaction to it until you have been eating that food for so long that you just can’t ignore the symptoms anymore (which may take several weeks). This is especially easy to do when symptoms are mild and fairly nebulous (such as mood changes and fatigue). In this case, it may be difficult to retrace your steps and determine the real culprit. Look to any foods you have been eating frequently since reintroduction. Eliminate all possible candidates (which might mean the last six or more foods you reintroduced). When in doubt, roll back to the full-on AIP for a few weeks or until your symptoms resolve completely, and then start food reintroductions again (being more critical and more patient this time, and waiting longer between reintroductions). When it comes to food reintroductions, there is no right or wrong way to choose where to start. 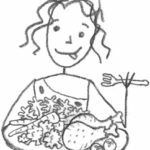 My suggested order of food reintroductions takes into consideration both the likelihood of reaction (based on what science says about how that particular food interacts with the gut barrier or the immune system) and the inherent nutritional value of the food. There are four stages. The first stage includes foods that are most likely to be well tolerated or are the most nutrient-dense. 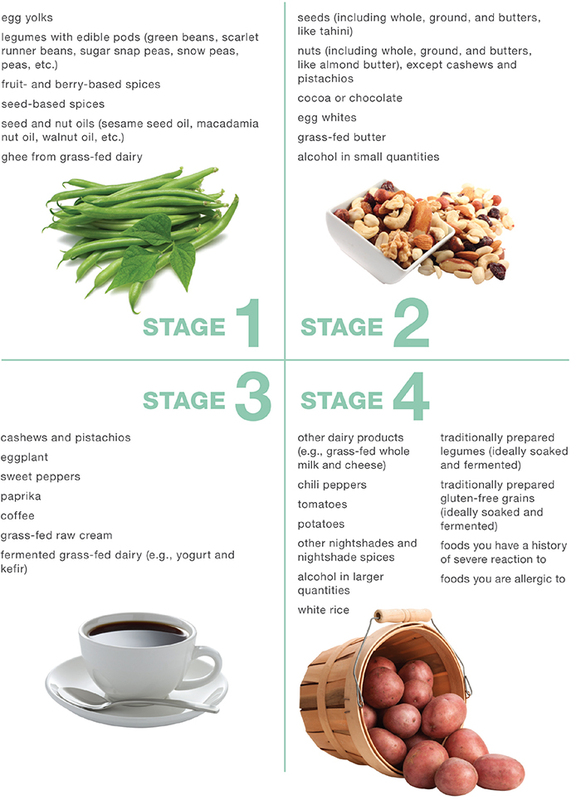 The second stage includes foods that are less likely to be well tolerated or are less nutrient-dense. The third stage includes foods that are even more unlikely to be well tolerated. The fourth stage includes foods that are most likely to be untolerated and that you may never wish to challenge. 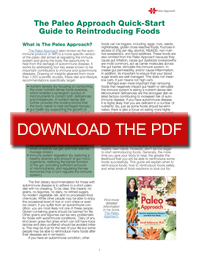 For more details on how to navigate through the reintroduction stages, see The Paleo Approach Quick-Start Guide to Reintroducing Foods or Chapter 9 in The Paleo Approach. Yes, food reintroductions can be a long process, but reintroducing foods too quickly may cause a flare in your autoimmune disease, which has the potential to set you back for much more time than it would have taken to reintroduce foods carefully and methodically. 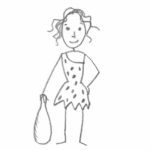 The Paleo Approach Quick-Start Guide to Reintroducing Foods has even more information than this post. You can download it for free here. Love, love, love your hair in the new picture on the right (with you in the lab coat). I giggled last week when you said you had finally learned how to style your hair. 🙂 We are kindred spirits with similar hair type. I switched to all Morrocco Method products last year after you raved about them. I love the products too, and while my hair is tons healthier, I still struggle to find the best way to style my hair without using heat and can’t figure out what would be the best haircut to facilitate no-fuss styling in spite of lots of reading on the internet. So far the best I’ve come up with is air drying and then putting in flocked hot rollers for a minute to give it a bit of polish and pizzazz. I blow dry once in a while when I want it straight and smooth, but it obviously dries my hair out if I do it too often. I would love it if you shared your newfound healthy styling tips and how your hair is cut (long layers or blunt?). Thank you! THANK YOU!! Have the book, but haven’t gotten to that part yet, and am anxious to re-introduce a little bit…and I was confused by the contradicting information on the web. Trust in you, so I am excited! I was sick for 27 years when I started the AIP. It has worked wonders. At first I just looked at AIP as an elimination diet. I started adding foods back in to see which were actually causing the problem. After a few years of trying I realize that I can not add anything to the AIP protocol. There are some other metabolic problems that require tweaking (I finally realized I need fructose.) due to an immunosuppressant I need to take for a transplant. So if I ever finally sort out all the metabolic conundrums maybe I can widen my food choices. However for now it appears that I need to be 100% compliant for the rest of my life. I’m not complaining though, it’s worth it to be healthy. Hello, please if you get the opportunity to respond to this comment I would be really grateful. To keep it short I am an autoimmune sufferer, wanting to do AIP, starting to transition. Looked on the Western A Price website that talks of various grains, pseudograins and on it, coconut appears to have 357mg/100g Phytic acid, more than White flour which they state is 258mg/100g…?????? first of all great job! Read your last post about stress and its impact on finally getting the hashi diagnosis, it nearly moved me to tears it felt so relatable to the journey I began last jan ( though once again in realith so much earlier). And if your flare up doesn’t seem to go away how long should you try to cleanly eat aip for before reintroducing another new food? Thanks so much for all you do even when it pushes you too far down this rabbit hole called autoimmune disease! Should I / can I take a probiotic pill form gluten free while doing AIP. Also, I’m two weeks in to the diet and felt great initially but am now having hypoglycemic crashes between meals. My meals are frequent now and I feel like I’m eating all day. Please help. Hi Sarah, I am looking to do the full AIP soon. I have not been 100% compliant on the diet but my doctor ran a test and diagnosed me with low level allergies (barely a 1 on the test) to wheat, peanuts, soy and corn. I have noticed that I am cross reactive now to green beans since I have been away from them. Ironically I was roasting raw green beans and every so often I would take one out so my husband and I could sample them. Within 15 minutes of eating them, I would experience what I call a shock headache. A headache would hit me and for about a minute and then it was gone. I knew this had to be some sort of cross reactivity and when I looked it up, I found that green beans were in the same family as soy and peanuts. I have since discovered quite a few other items I am reactive to in this group. My question is,do you know how effective Low Dose Allergen (LDA) Therapy for food allergies? 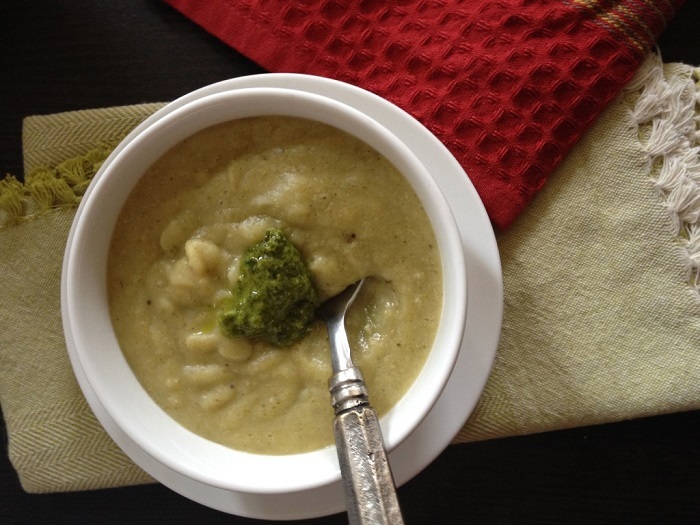 Have you heard of this therapy for dealing with food allergies before? If so, what are your thoughts on it? I thought I would ask you as I am in the process of gathering information on it. I am wondering, after spending time on AIP do sensitivities tend to reduce? what i don’t understand is in cutting out foods and then reintroducing, are we likely to be successfully reintroducing foods we were never sensitive to in the first place, or have sensitivities reduced to foods that were a problem no longer are? I have Interstitial Cystitis and am on an extremely limited version of AIP as so many foods flare my bladder (about 14 veg, meat / fish, coconut, pears, raspberries, and olive oil). I am wondering if what i can tolerate is likely to increase over time as my body heals? Hello! I’m hoping you might help answer this question for me. My daughters and I have followed the GAPS Diet (and I followed AIP for 6+ mos) for almost 2 years. Attempting to slowly introduce every single food that you plan to ever eat seems very overwhelming…. especially with ayoung child who has never had certain foods (such as grains, dairy, peanut butter tomato, pepper spices, etc). It could take over a year to reintroduce/introduce foods one at a time and every 5 days or so. Sometimes I think I’ve made myself a little fearful of food. Does the skin test really work – ? I’m nervous to try rubbing peanut butter on a toddler who had never tasted a drop. She was given a mini Oreo cookie the other day by another child and overall she did well but I did notice a couple small pimples on her face the next day. Who knows what caused it since that little cookie probably had a dozen ingredients she had never ingested. It also seems overwhelming to even start this with 3 different people & keep track of reactions & who can eat what – a spreadsheet? Please help. I really want to be able to eat a basic gluten free cookie on occasion (family vacation etc) or not freak out if another child gives my child something to eat. Thank you so much! Can u plz tell me in which stage whey protein isolate would be in? I’m wondering if it might be better tolerated than butter and cream because it doesn’t contain casein protein? Hello, I am on my third try with Paleo AIP. I started having digestive issues when I was 18 due to what I suspect was overuse of ibuprofen. After the first few months, my digestive symptoms were very manageable, with just non-painful bloating and very occasional sharp pains. After about 5 years, my symptoms turned systemic. I literally woke up one day with exhaustion and foggy brain. Since then I have maybe gotten 15 nights of my needed hours of sleep in the past 8 years, despite having ample time for sleep. My body now just wakes up earlier than I want and I’ve never been able to nap. My problem is that while on the diet, my minor digestive symptoms go away, but I have always been able to deal with them. I’m supposed to be getting a lot of sleep on this diet, which, along with clearing up my foggy brain, is all I really want. I would gladly have my mild digestive symptoms for the rest of my life if I could just start sleeping well and thinking clearly. How am I supposed to heal if I can’t sleep enough? Sleep is essential for healing, as you are clearly already aware. 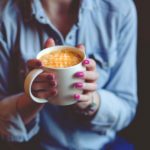 I highly recommend you check out the post, 10 Tips to Improve Sleep Quality, as it is full of helpful tips.